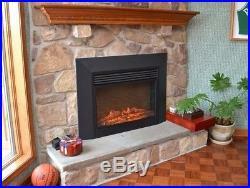 Touchstone Ingleside 28 Inch LED Electric Firebox Fireplace Insert #80009. Designed to replace your current wood or gas fixture fireplace insert. Includes a 3 inch frame seamless hearth placement. Features Touchstone's industry leading realistic flame. Adds heat to a room up to 400 sq. Overall dimensions of 34.25" W x 27" H x 8.75D. The Ingleside by Touchstone is another product developed in response to many customer requests. Customers love Touchstone's industry leading smokeless flame and often ask about an option replacing a current gas logset or wood fireplace. Touchstone created the Ingleside to meet those requirements, with a realistic flame with 5 flame settings, additional heat up to 400 square feet, and a design that will work with fireplace openings of over 28 inches wide and 24 inches high. 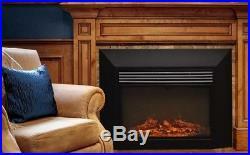 The 3 inch frame covers all seams between the fireplace and your hearth a perfect installation every time. Like all Touchstone fireplaces, the Ingleside can be used all year long, with or without heat. The advanced technology includes built-in technology to eliminate overheating. The included Touchstone remote lets you control the 5 flame settings and 2 heat settings independently, right from your favorite chair. Eliminate the mess and the costs of a real fireplace. While the realistic flame is what draws people to Touchstone fireplaces, what sets the Ingleside model apart is its ability to remove the hassle of messy wood flames and expensive gas logs from your life. You'll no longer need to deal with sweeping up ashes, dragging in dried wood or cleaning up ember burns on your floors. The Ingleside's flames are driven by LED lighting, which is the most cost efficient and longest lasting lighting technology available. About the benefits of electric fireplaces. The most realistic flame available. Touchstone's flame technology is simply the best available in electric fireplaces. No other LED flames look so real, burn so brightly or have the realistic flicker of a real flame. Placed in the center of your hearth, the Ingleside electric fireplace will deliver the same comfort and relaxation as a gas or wood fire, without the mess. The flame has 5 settings, from a relaxing low light ember quiet nights, to a full raging fire that's perfect a chilly night. Don't forget it heats the room too! The Ingleside will warm up a room up to 400 square feet, with forced air heat that takes the chill out of room quickly. The included Touchstone remote lets you control the heat and flame from anywhere in the room. The Ingleside gives you the option of using the built-in timer to control the heat setting a duration up to 7.5 hours. The Ingleside comes in two parts, the firebox and the frame. The Ingleside firebox has four rubber feet to sit nicely and evenly on the base of your current fireplace. Just place the firebox right into your current hearth, and then attach the frame to help mask the break between the firebox and your hearth. No special hardware required - simply find the closest outlet and plug in the Ingleside. 2 heat settings (high and low). Remote control heat and flame setting (batteries not included). Dual mode, operates with or without heat only flame effect. Built in timer mode shut off in 30 minutes to 7.5 hours. 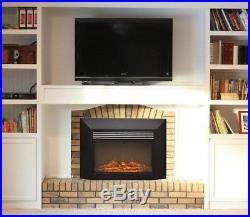 If mounting under a wall mounted flat panel TV, mount fireplace at least 24 below the bottom of the TV. 34.25" W x 27" H x 8.75D. 27.75" W x 23.75" H x 8.75 D.
26"W x 14.75"H. 39"W x 32"H x 13D. Replacement of any non-functioning lift parts Toll-Free Customer Service & Support (English & Spanish speaking) includes cleaning instructions for stain removal, cleaning products, and/or assistance from a professional cleaner or a repair technician. Touchstone shall not be responsible for any warranties other than those provided herein. Repair and/or replacement of any damaged components in these situations shall be subject to additional repair and/or replacement charges. Cabinet or aren't able to mount a flat screen TV. For help installing your Plasma TV or LCD TV in your new cabinet. (with the exception of our Elevate TV Cabinets, Lifts, Fireplaces, and Spare Parts orders) , to customers in Canada. (with the exception of our Elevate TV Cabinets, Lifts, Fireplaces, and Spare Parts orders). You are responsible for mounting the fireplace on or in the wall. A video on installing the fireplace. You are responsible for unpacking the fireplace, disposing of packing material and placing of the fireplace in your house. You are responsible for mounting the lift mechanism in the cabinet. This is a simple installation. You are responsible for unpacking the Elevate cabinet, disposing of packing material and placing of the cabinet in your house. GRAND ELEVATES - LTL LIFT GATE SERVICE. Our LTL Lift Gate Service is included in the price of our Grand Elevate cabinets, which includes bringing the cabinet to your home, but it is not unpacked or placed in your home. The Grand Elevate arrives completely assembled. FULL SIZE CABINETS, MID SIZE CABINETS, PREMIUM BEDROOM AND CONESTOGA CABINETS - WHITE GLOVE SERVICE. Here's what is included in your White Glove Service. TV Cabinet installation by two trained service providers. Removal of TV cabinet from packing material. Positioning of cabinet on the first or second floor of your home, according to your specifications. Please make sure your location of choice is accessible and that your cabinet will fit in stairs and doorways leading to the location. Placement on any floor other than first or second floor may incur additional charges. Installing components (cable boxes, satellite boxes and DVD players) and cables are the customers responsibility. Perform a final check that all services were performed to your satisfaction and that the TV Lift cabinet was received in good condition. 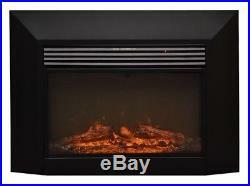 ONYX XL ELECTRIC FIREPLACE - LTL LIFT GATE SERVICE. You are responsible for unpacking the OnyxXL, disposing of packing material and placing of the fireplace in your house. The fireplace comes with stones or crystals for placement in front of the flame, which need to be installed by removing the front glass of the fireplace. Mounting the OnyxXL on the wall follows the same process as the standard Onyx, so reference the Onyx video for installing the fireplace. We sincerely appreciate your business and look forward to serving you again in the future. The item "Touchstone Ingleside 28 Inch LED Electric Firebox Fireplace Insert #80009" is in sale since Tuesday, January 23, 2018. This item is in the category "Home & Garden\Home Improvement\Heating, Cooling & Air\Fireplaces & Stoves\Heating Stoves". The seller is "maxoptical" and is located in Downingtown, Pennsylvania. This item can be shipped to United States.